This kit was designed for use in commercial kitchens but it can be used in any application where the risk of burns is high. It is not meant to be used alone, but in conjunction with the appropriate general first aid kit, depending on the number of people it needs to service. Burns should be treated with water if possible. 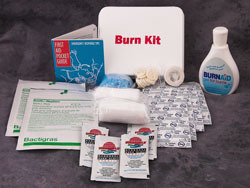 The severity of the burn is important and any third-degree burn should be treated by a medical professional. Please see the FAC bulletin on burns for details. But in practice, people DO have to go back to work or play; the purpose of the bandage is to keep the wound from being further contaminated. You may use fingertip cots for that purpose but they should be removed as soon as possible to promote healing. NEVER use ointments or creams. They just prevent the wound from beginning to heal. ALWAYS cool the area. The Gel products in this kit perform a similar function to water – they cool the area and they also take some of the pain out of it. There's an exceptional product available called "Bactigras"® which is a gauze pad impregnated with an anti-bacterial agent. It's useful in the case of burns where there is open blisters and there might still be contaminants IN the wound. Even impregnated pads should be removed soon, to let the wound dry out and begin to heal. Remember: when treating a wound, put on gloves to protect both you and the patient. When you're done, dispose of the waste properly, wash your hands and if you're in a workplace, log the incident carefully.